We recently have compiled a questionnaire that we have been sending out to many new owners of our Atlantik LED Pendant asking for their feedback. Carl M. is the first person to buy the new Atlantik LED Pendant and we will start with Carl’s response below. Other owners’ feedback will follow as we get their replies back. 1. Is this your first LED reef aquarium light? 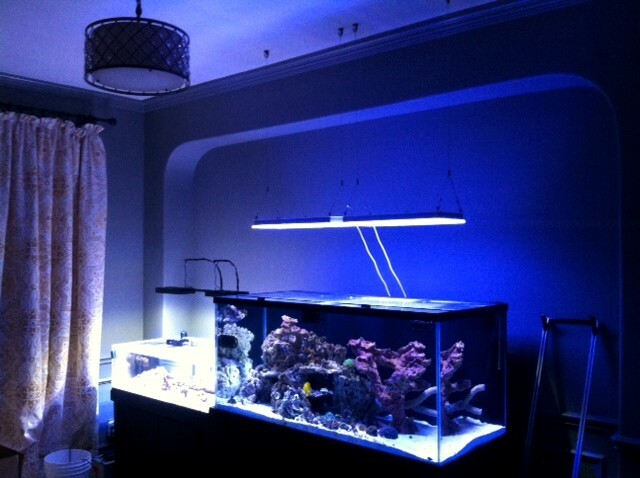 Carl M. No – I started with two, 48″ Reef Bright 3 watt Cree HO LED strips on my first 55 gallon tank. 2. If not, what was your previous lighting system? 3. If you had a previous LED system, what is the reason you chose Orphek over your present LED system? Carl M. For my new 190 gallon build I was able attend MACNA in Dallas. I had already purchased four AI Vegas for the tank but when I saw the Orphek booth I had to take a look, which is where I met Scott. The color and coverage caught my eye first. Two units would cover my tank perfectly and the PAR readings were no comparison with the Vega. Overall color also looked great and the quality of construction of the units was impressive. I can tell you that the construction of the new lights, power supply, and controller for the Atlantik exceeded my expectations with all solid aluminum and clean acrylic. 4. What difference have you noticed about the Orphek Atlantik LED over your previous lighting system? Carl M. Superior coverage, controllability, and much deeper color spectrum over the blue and whites from Reef Bright. The Vegas were disco balling through my rocks, these do not do that! Carl M. Reef Aquarium , Orphek Atlantik IN Slow Acclimation mode ! 5. Do you feel that your Orphek LED Pendant is a good value? Carl M. Excellent value as I can use fewer units for full coverage, better lighting spectrum, and no disco ball effect! 6. What is your opinion of the quality of Orphek LED Lighting? Carl M. As stated above – exceeds my expectations so far. Solid and well built with superior design. 7. Would you choose Orphek again for a future aquarium? Carl M. This is my first light system from Orphek and it has only been up for a few days so at this point, I absolutely would buy another and recommend to others. 8. Have you noticed any improvement/growth in your corals with Orphek LEDs over your previous lighting system? Carl M. Sorry but too soon to tell. 9. What made you decide to choose Orphek as your reef aquarium LED lighting system? Carl M. Company reputation, reviews of the previous pendant (Nilus), spectrum, intensity and PAR value, fewer units required, and seeing the fixture at MACNA. It took a lot for me to commit to the cost of these knowing I had already purchased 4 Vega lights that I now have to sell 2 of. The other two will be on my frag tank.